I know I’ve talked about fall a lot lately, but today it’s all about snow. Seriously, it’s freaking cold outside, it might just snow any day now! I guess this wouldn’t exactly surprise me, considering I live in Northern BC. I just need to prepare myself mentally for the cold we are about to experience! So let’s talk salad. Thanksgiving, Halloween….these festivities don’t help with the diets. But this salad does. I wanted something healthy and this salad does the trick. I’ve never really made any salads with fruit in it, so I LOVED how this one turned out. 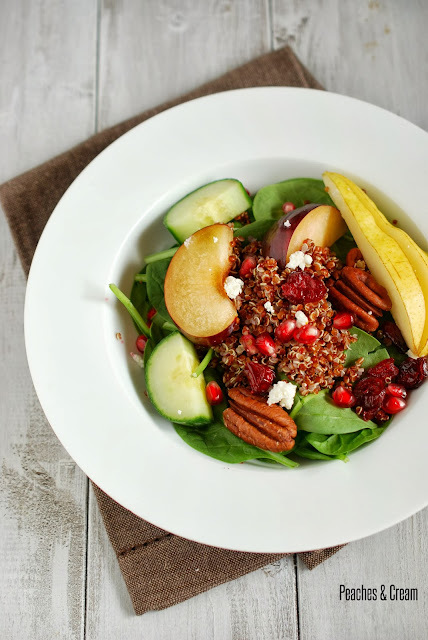 The mixture of fruit, veggies & quinoa really makes this salad attractive & charming. I usually get bored with salads but I can’t imagine it happening with this one. I could eat it for lunch or dinner every day! On another note, GAVIN BOUGHT ME A NEW CAMERA!! I am the proud owner of a Nikon D7100. *Beam!*:D. I am already in love with it & I can’t wait to start posting pictures from it (still have a few posts with my old camera!). Hope that everyone has a great weekend and enjoys the Halloween festivities! In a small saucepan over high heat, bring water to a boil. Add in the quinoa, reduce temperature to low, cover with a lid & cook for 15-20 minutes. Remove from heat and allow to coil slightly. In a food processor or a blender, combine the pomegranate juice, vinegar, ginger, garlic, salt and pepper. Stream in the olive oil until the dressing comes together. Store in the fridge for up to one week. 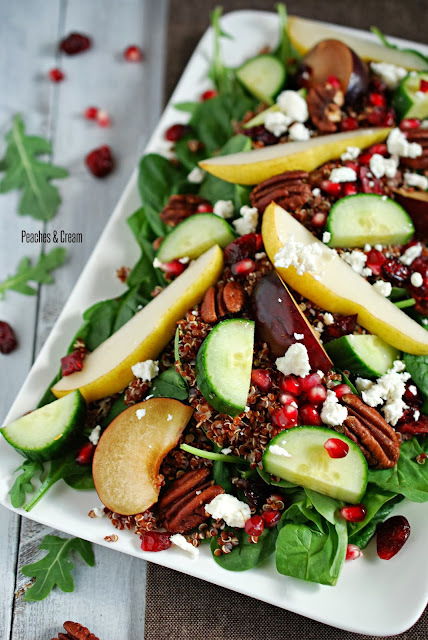 Toss the mixed greens with the dressing & divide into 4 plates, as well as the quinoa. Top with ¼ of the pear, plum, cucumber, pomegranate, pecans & goat cheese. Serve immediately. I am so into pomegranates right now! They have officially replaced pumpkin! I can't wait to see all of the pics to come with your new camera! ME TOO!! I love how gorgeous they are-so beautiful! Thanks so much Mallory-I am definitely nervous with the new camera, but excited at the same time. It's a steep learning curve! !